When personal trainers start researching whether or not they should add a personal training software tool to their business, the biggest question is usually whether or not it is worth the monthly costs compared to the traditional personal trainer method of writing down workouts using a good old pen and notepad. Some of the benefits that are advertised by these softwares include how creating workout programs, scheduling, progress tracking and communicating with clients is much more effortless with software. Having been through the process of investing the time and energy to becoming a trainer myself, I know exactly how valuable our time as trainers is. The difficulties of the job require that we be as efficient with our time as possible to ensure we can have a long-term career. In this article it is my goal to provide some quantitative data so that you can get a better understanding of how much time you can actually save with using personal training software. The area I will be focusing on primarily is program design for my clients since this is what typically takes me the most amount of time to do. I set up head to head test to time how long writing a program took on average using the typical pen and paper method for program design and then compared my findings to how long it takes using a personal training software tool. Now, you can easily understand how much time can approximately be saved by using personal training software and how much your time is worth to you. Since our time is so valuable, I will stop wasting yours and get right into the bulk of the article. Since I haven't been using this method for quite some time now, I asked a friend of mine (that will never change) if he could time how long it took him to write down his daily routines for his clients. Tad has been training people since the mid-80s and although I have seen him try to incorporate technology, it had never really stuck with him. The only thing that Tad uses is a printed out workout schedule. He then adds the exercises, sets, and repetitions by hand. There is also a section where he adds comments or tips for each individual client. Here are the results that I received from Tad. He ended up running the stopwatch straight through the organization and planning workout program for 10 clients that he was working with the the next day. He did not pause the stopwatch at any time while creating the workout plans. This means that he did not time each individual workout program on their own. The total time for creating the workout plans for 10 clients was one hour, 13 minutes and 27 seconds. We will just round up and say 73.5 minutes in order to program 10 clients. Taking this number and dividing it by 10 gives us an average of 7.35 minutes per client. I think it’s important to keep in mind that Tad has been doing this for approximately 30 years now. He is probably faster than most people at creating his workouts by hand because he knows his clients very well and has an internal exercise library larger than most. Now, let's see out how long this process would take using a personal training software app. In this example I'm going to be using the personal training software platform StrengthPortal. In order to have fewer discrepancies I timed my 10 program designs without pausing the stopwatch. The 10 personal training clients I am creating the programs for are online clients of mine. Six of them are clients I have been working with for a while now, and four of them are newer clients. For clients that you know well it should be easier to choose the exercises and weights used. Here are the results for the 10 program designs using StrengthPortal. For all 10 of my sessions the total time was 37 min and 55 seconds. We will run this up to 38 minutes and divided by 10 making it 3.8 minutes per program. Overall using software platform took significantly less time than the results Tad came up with. To be specific, it took me almost half the time it took Tad. Using these two samples of writing workout programs for 10 clients a night, we found that using personal training software could save you approximately 35 1/2 min. I performed this study with 10 clients solely because it is a very round number. Obviously there are some people with much more clients than this. In fact I know some personal trainers and online coaches that are doing online personal training with close to 100 clients overall! 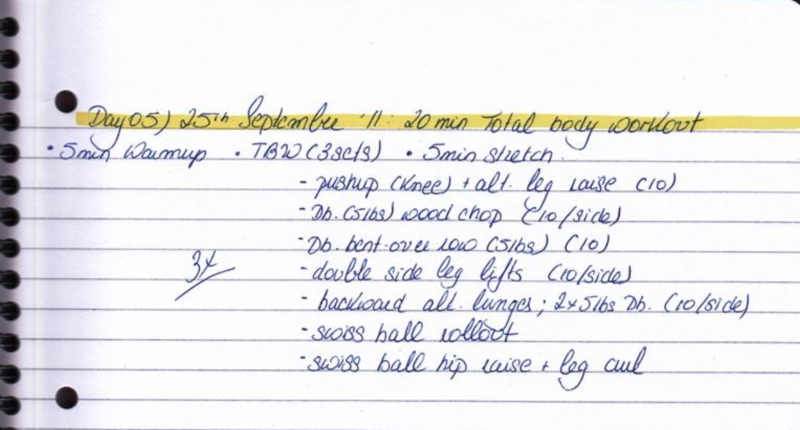 At that level the difference between handwriting 100 workout programs and using personal training software is 3.5 hours! Personally, having worked in this industry for a while, I would say the average personal trainer works with about 20 clients a month. If you are working with twenty clients month to month using a software tool would save you 70 minutes each time you have to write your clients new programs. If you are writing programs once a week, that means you would be saving over 4.5 hours a month. If you break that out to the rest of the year, that’s over 55 hours a year. That’s over two whole days! I don't know but you guys but I fight for every minute of my time I can get, so two days would be a huge win for me and my business. What are some reasons for the differences? Overall I think the biggest reason why personal training software the so much quicker is due to the fact that writing by hand is extremely slow. If you try to write fast (especially me) my handwriting becomes illegible and when you look at it the next day you’ll be confused as to what you even intended to write in the first place. We’ve all been there. With personal training software there is very little typing involved. For example, with StrengthPortal you have a huge exercise library with exercises to choose from when you first make your account which makes it easy to get started writing programs right away. If I am having my client perform chest exercises, it only takes me one click to look up dozens of chest exercises to choose from. Without an exercise library to remind you of all the exercises that you know (and many that you don't), you have to rack your brain to remember them. Mentally going through your exercise library takes a lot of time in order to pick the perfect exercise for your client. Being shown a wide variety of exercises available and simply selecting them with the click of a button is huge value-add. Another advantage that StrengthPortal has which I haven’t even mentioned up to this point was that their program creation tool supports the ability to create workout program templates that you can copy, edit as a new version, and continually re-use just like Google Docs. That feature might trump them all. For the purpose of this test I wrote all my workout programs from scratch in StrengthPortal for my clients, but if I did this exercise again and already had templates I could work off of? That’s even more time saved that I can utilize to expand my business in other projects. Well there you have it ladies and gentlemen. What will you do with this information? How valuable is your time to you? What would time saved by using software for your training business do for you? As I mentioned earlier, my time is the most valuable thing for me and having more of it is extremely important. Now it's time to show Tad the results of this experiment to see if we can change his mind about switching to personal training software. It will still probably failed to convince him, but it 100% worth the effort. Tyler Read has over ten years of experience in the personal training industry and holds an M.S. in Kinesiology. In addition to training a wide variety of clients, Tyler is also the founder and senior editor of Personal Training Pioneer; a website designed to help people become industry leading personal trainers. StrengthPortal inteview with Dr. Ted Vickey to discuss his 25 years of experience in exercise science and business, with special expertise in fitness technology.